Though I usually limit myself to collecting titles written by residents of the Shenandoah Valley during the antebellum period, or those focused on the antebellum Shenandoah written after the fact by those who lived it, I do stray from that path from time to time. In one such instance, not too terribly long ago, I landed a copy of Hudibras; In Three Parts: Written in the Time of the Late Wars. Without going into great detail about the book, in short, it was a work originally written in the latter portion of the seventeenth century (my copy was published much later, in 1849, by Silas Andrus and Son, in Hartford, Connecticut), and “is a satirical polemic upon Roundheads, Puritans, and Presbyterians during the English Civil War” (for more details, see the Wikipedia entry, here). I didn’t purchase this book with a strong interest in the subject matter, but rather over the curiosity I had with the owner who happened to have this book in his collection. As indicated in owner’s signature on the title page, the book once belonged to “Leroy G. Edwards”, of “Deep Creek”. 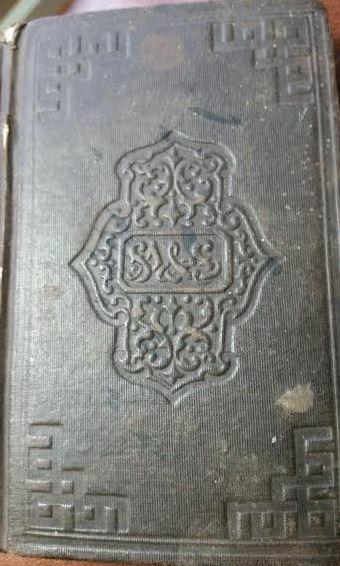 In turn, a book shop’s stamp inside the cover might suggest—if Edwards did not receive the book, second hand, at some prior to his death, in 1866—that he purchased the book in Philadelphia. “Leroy G. Edwards” was actually Virginian, LeRoy Griffin Edwards. Born in 1804 in Northumberland County, Edwards had ties to some rather prominent families in Virginia’s history—the Lee and Ball family being among the list. Though there isn’t much available on his early life, Edwards is recorded as having relocated to Norfolk County sometime around 1831. After a few years service as a teacher, in 1835, he was elected “collector of the tolls” of the Dismal Canal Swamp—a position he continued to hold through 1865. Despite the demands of this position, Edwards also remained active in local education, being elected as the first president of the Norfolk County School Board, in 1845, and later, in 1857, the county’s superintendent of public schools. A year later, he added yet another title to his resume when elected Clerk of the Courts for Norfolk County. A more complete summary of his biography can be found in pages 264-266 of Memorials of Old Virginia Clerks (1888). 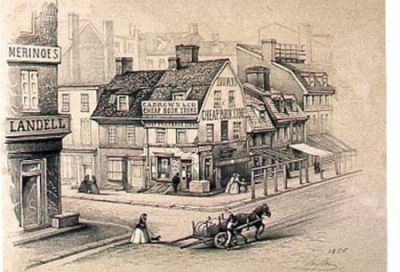 Before I go into much more depth regarding Edwards’ life, I believe, as I indicated earlier, if he didn’t receive the book second-hand, he may have purchased it in Brown’s Cheap Book Store, in Philadelphia. At least a few small points lead me to think this. For one, it wasn’t uncommon for residents of the North and South to move back and forth between the two sections on pleasure trips. 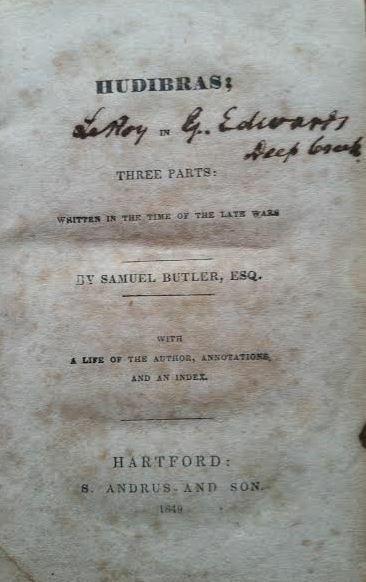 Furthermore, considering the book was published in 1849 and Edwards died in 1866, we have a rather narrow time-frame in which Edwards could have come into possession of the book. The third and perhaps key to solving the mystery is in the address of the book store as provided on the label. Thanks to a contemporary Bryn Mawr College Website, I was able to establish that the book store was owned by one Charles A. Brown, and that he maintained the store on “the N.W. Cor. [ner] [of] 4th and Arch only until 1857, at which time “E. Ketterlinus” began occupying the business location. 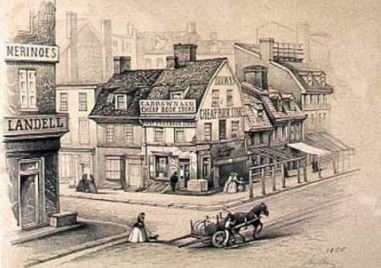 Incidentally, there had been a name change sometime just before 1850, when the street name, “Arch” was changed from “Mulberry”. So, from the label, we have to know, at least, that it was not affixed to the book until after 1850. 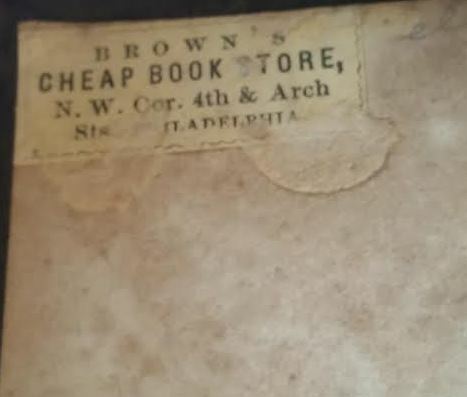 In short, whether Edwards purchased the book or not (and if Brown did not carry this book over to his new location, not bothering to change the label), it seems likely that the book was purchased sometime between 1850 and 1857. Granted, knowing the purchase date of the book is really a minor point, but it was entertaining putting those pieces of the puzzle together. This aside, the “hook” that really made me most interested in this book is in the fact that Edwards was the president of Virginia’s Constitutional Convention of 1864. This is likely the “ahhhh” moment for those who have followed this blog in the past and know well my interest in Virginia’s Southern Unionists. Now here’s the tricky thing… Edwards was also a slaveholder. Of course, it’s no great surprise to some who know that being a Southern Unionist was not some automatic indication of the person being either an abolitionist or in favor of the emancipation of slaves. In fact, it gets rather complicated when we consider Edwards. The delegates debated whether the abolition of slavery should be gradual or immediate, and whether it should be compensated in any way. On March 10 they voted on the unanimous adoption of the committee report abolishing slavery, which became Article IV, sections 19 through 21 of the new constitution. The final vote was 15 to 1, with William Moore, a Northampton County farmer, casting the lone negative vote and John Stone, a Princess Anne County farmer, not recording a vote at all. So, we know Edwards was among those in favor. There’s yet another twist, however. Edwards had three sons in the service of the Confederate army, all of them entering as teenagers. John Robins Edwards and Griffin Fauntleroy Edwards were members of Company A, 3rd Virginia Infantry (Kemper’s Brigade, Pickett’s Division); John being a 1st lieutenant, and Griffin being a private; and the third son, LeRoy Bushrod Edwards, serving in the 61st Virginia Infantry (Mahone’s Division), first as a sergeant-major, and afterwards adjutant. Considering LeRoy Griffin Edwards’ vote for the abolition of slavery in Virginia, on March 10, 1864, it seems an irony of ironies that the Unionist’s namesake (excepting the middle name, of course), serving in the 61st Virginia Infantry, was in the thick of the fight at the Crater, in Petersburg (just under five months later), when Mahone’s men clashed with men from the United States Colored Troops… many who were freed or escaped slaves. … a gentleman of high literary attainments and universally popular. He was an upright and honest man, a good citizen, a devoted husband, father and friend, and as affectionate and tender in his feelings as a woman. ← Which has greater value – Literary Product or Revealed Intellectual Process? As a point of clarification; Leroy Bushrod Edwards & his brother John Robins Edwards served in the 3rd Virginia Infantry. Griffin Fauntleroy Edwards served in the 61st Virginia Infantry.